Hong Kong, January 2019 –– At the JW Marriott Hotel, True Partner received their 1st prize during the awards ceremony. True Partner Advisor was nominated with the True Partner Fund and winner in the category Relative Value. 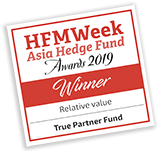 This is the second time True Partner Fund wins the HFM Hedge Fund Asia Awards. In 2015 the fund received the 1st prize in the category 'Arbitrage & Relative Value'. 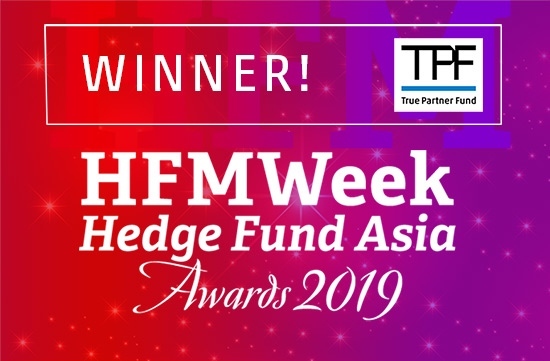 The award is about celebrating the top performing hedge funds in the Asia-Pacific hedge fund industry. It brings together both international and Asian hedge fund managers and investors to acknowledge the achievements of the best in the industry. This year both the performance and service awards were merged together to create one event. The evening is an excellent networking opportunity to build meaningful business relationships with hedge fund professionals and clientele in an informal, entertaining evening. The list of winner per categorie is available on the website of Hedge Fund Asia Awards website.